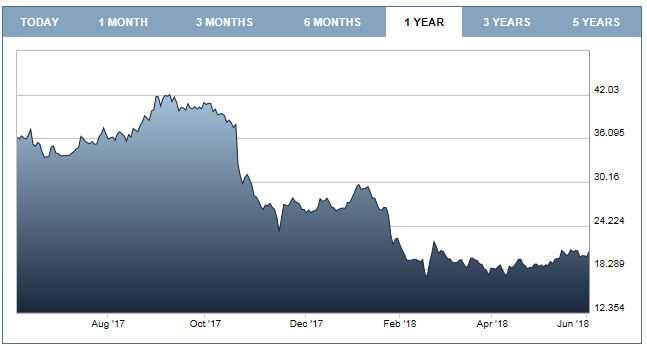 The collapse of stock market confidence in Magnit, the largest and most valuable Russian retailer in the domestic and London stock markets, has triggered widespread speculation that Sergei Galitsky, 50, the founder and control shareholder of Magnit since 1998, was attacked by corporate raiders led by Andrei Kostin, head of the state VTB Bank, and Alexander Vinokurov (lead image, above), son-in-law of Russian Foreign Minister Sergei Lavrov (below) and business associate of Mikhail Fridman, owner of X5, the second supermarket retailer in Russia and Magnit’s biggest competitor. As a two-step plan of takeover, the exit of Galitsky (born Arutyunian) and the takeover by VTB and Vinokurov, have been reported in the Russian press as the business deal of the year. But they are unable to agree on why it has happened. A half-dozen reporters from Russia’s leading business media, who have covered the deal, and sixteen of the analysts they have quoted in their coverage, were asked to say if they knew of business conflicts Galitsky had been having; whether there was reason to believe that Kostin and Vinokurov had been acting in concert to oust Galitsky, drive the share price of Magnit down, and re-sell the asset to a potential competitor in the Russian retail market. Had there had been non-market reasons – asset raid in Russian — they were asked? More than twenty sources in all, but not one of them agreed to answer the questions on the telephone or by email, notwithstanding promises of strict confidentiality. Their fear is infectious; their reaction is the strongest confirmation so far that Magnit is the target of an ongoing asset raid, which will hold down the value of the company’s shares no matter how much Russian consumer income and market demand recover to lift Magnit’s financial results. On February 16, VTB announced it was buying 29.1% of Galitsky’s stake in the company, leaving Galitsky with 3%. That was an inconsequential stake for operational purposes; it was just enough to allow VTB to evade the 30% takeover threshold at which an offer to all minority shareholders was legally required. The deal was for Rb138 billion ($2.5 billion), a 4% discount to the share price on the day. The Financial Times took Galitsky at his word when the London newspaper reported him as saying: “It’s time to change something in my life. It was a good time. It was a difficult decision, I founded this company. But nothing lasts forever. 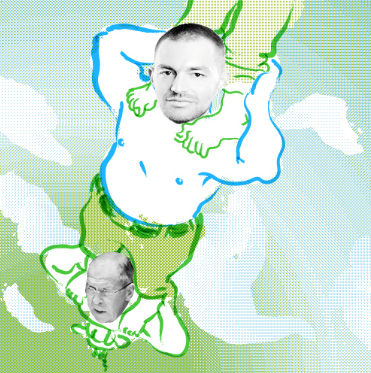 The impetus was that investors don’t quite see [Magnit’s] future like the founder does. I shouldn’t hold up the process – if investors want changes, they should get them.” The Economist reported Galitsky’s sell-out as “the result of a tough business cycle and some strategic mistakes”. According to Magnit’s investor presentation of October 20, 2017, the free-float of investors in the company added up to 63.5%. 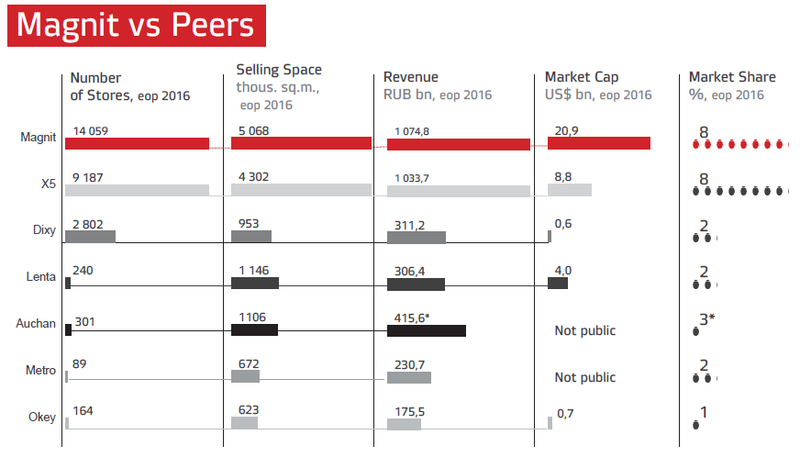 At that moment, Magnit enjoyed a market capitalization of $19 billion, the second largest for retailers in the European market. Notwithstanding, not a single investor in Magnit came forward at the time of Galitsky’s sellout, or since, to confirm his claim of investor conflict, or to explain the purported mistakes Galitsky has been accused of making. On May 24, VTB announced it was re-selling an 11.8% shareholding in Magnit to a newly created entity called Marathon Group, controlled in Moscow by Vinokurov. The transaction was publicly valued at Rb62.5 billion ($1.05 billion). No VTB press release was issued for this sale. The only press release from the bank was for the February deal with Galitsky. Kostin claimed “using VTB Group’s expertise and financial resources we plan to take Magnit to a new level of its development.” In fact, he had no such intention. Marathon’s corporate slogan is “whatever it takes”. That included most of the money required for the Magnit acquisition which was loaned to Vinokurov by VTB. Other clients and partners of Vinokurov, which include Mikhail Fridman’s group owning X5, Magnit’s principal competitor in the market, may have also financed Vinokurov, market sources suspect. Vinokurov has told reporters he initiated the deal with Kostin; he added he has never met Galitsky. Operational and board control of Magnit was also handed over by Kostin to Vinokurov and his associates. In their public statements they have blamed the market for under-valuing Magnit; they claim they will be able to do better than Galitsky in restoring market confidence. The American war and the oil-driven collapse of the Russian economy have hurt the competitive retail sector, like everyone else in Russian business. Magnit had been trading at a peak of $65 per share in October 2013. Then the rot set in. In 2014 and 2015 the share price see-sawed from lows between $37 and $44 and highs of $60 to $66. During 2016 the pessimism worsened, and the share price dropped to a low of just under $30 in mid-June 2016. At the start of 2017 there were signs of recovery, as the share opened the year at $44. Follow what happened towards the end of 2017 and into this year. 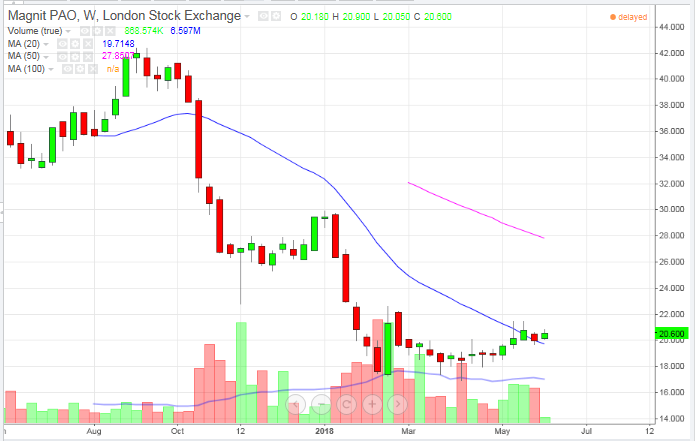 Unusual selling of Magnit shares occurred in October and November, dropping the price from $42 in September to $23.39 in mid-November. It isn’t clear what drove this decline except that the market could see that Galitsky himself was selling his shares, although within weeks he had bought them back. Magnit had recovered to almost $30 by the start of the new year, but collapsed again. The reason for that was the announcement Galitsky was selling out. The VTB deal disconnected market pricing of Magnit’s shares from the company’s financial performance and the future for the Russian retail market. Magnit’s share price dived on Galitsky’s exit by 35% to $18.35. London market sources understood that Kostin was operating for the benefit of concealed stakeholders; the market of free-floaters had no confidence in the outcome once Galitsky was gone. It was less of a surprise when the hem of the veil was lifted. On May 23, VTB announced it was re-selling to Vinokurov, and lending him the money to buy. According to VTB’s announcement, Magnit was “under valued” and its deal was intended to remedy that. Noone believed the claim. The share price dived again by 5% to $19.96. Vinokurov was viewed, according to market sources, as the front-man for someone else. Source: Company website, released March 23, 2018 -- The first-quarter 2018 results were issued on April 23. They show an acceleration of the growth rate in Magnit’s sales revenues, and improvements in gross profit, earnings (ebitda) and net income. The company’s bottom-line was still below its comparable performance in 2017, but the gap was shrinking. 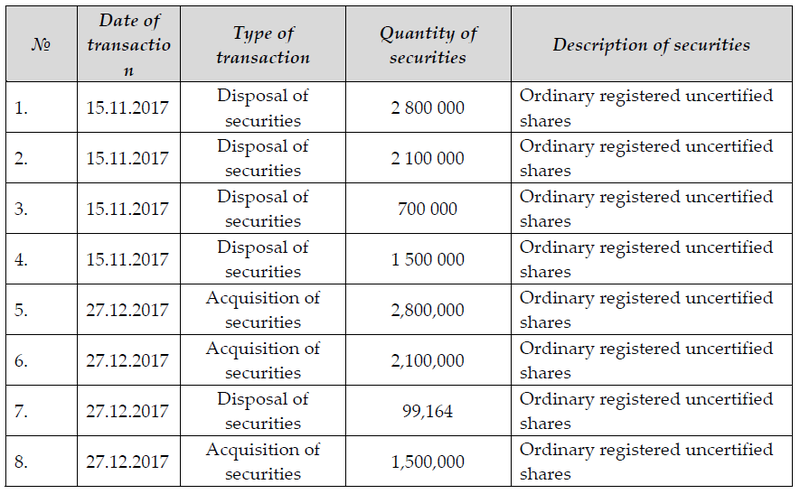 VOLUME OF MAGNIT SHARES TRADED — WAS GALITSKY ALONE IN DRIVING THE PRICE DOWN IN OCTOBER-NOVEMBER 2017? The biggest seller, and also the biggest buyer of Magnit stock in the October-November period, was Galitsky himself, as the company report for 2017 reveals. Galitsky’s purpose, which he and the company explained at the time, was to raise money for a football stadium and youth soccer school he directs in Krasnodar; and also to re-invest cash in the expansion of Magnit. The turnover was a signal of Galitsky’s confidence in Magnit, not a forewarning of his exit. 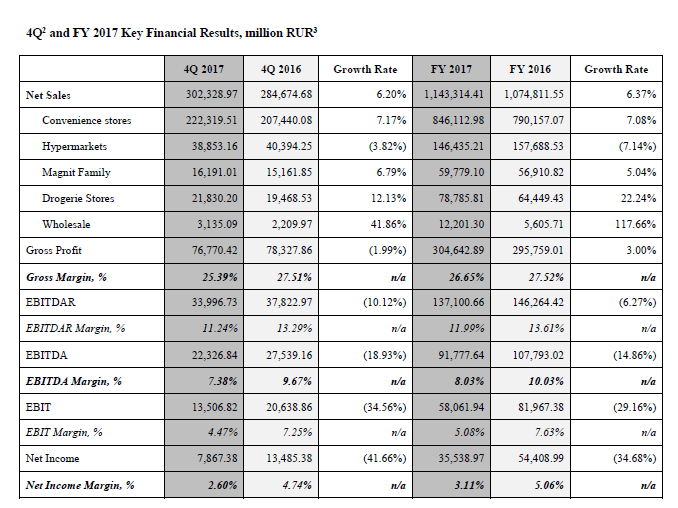 Source: http://ir.magnit.com/en/financial-reports/annual-report_magnit_2017/ Galitsky started 2017 with 35.11% of the company’s shares; he ended the year with 34.27%. Sources, traders and investors on the Moscow and London stock markets say that a review of both the longer-term trend in Russian supermarket operations, as well as the course of the business over the past six months, reveals that Magnit, X5 and Lenta, the third leading retailer in the Russian market, were all suffering from the decline in Russian consumer income and their capacity to spend money at the grocery store, as they had before 2014. 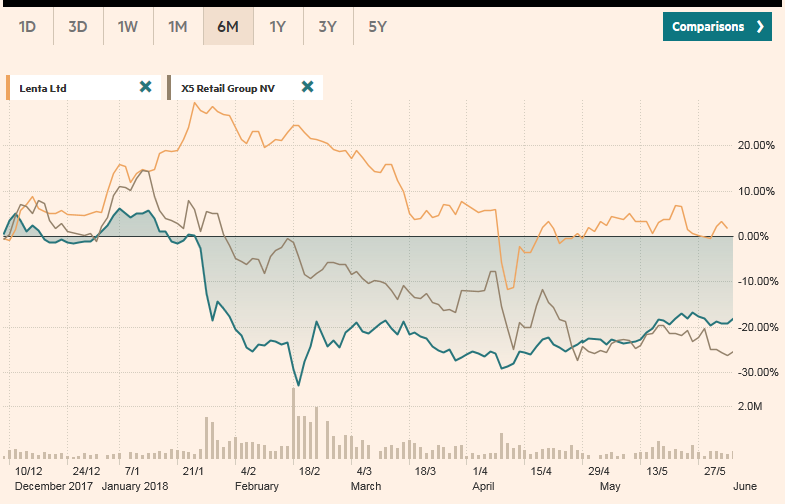 The charts show that the Big-Three were suffering similarly, though Magnit suffered more because it was much bigger and viewed more optimistically than its rivals. The switch point for them all occurred in mid-2015. Consumer income had begun to improve but X5 was better able than Magnit to exploit growth in the new low-priced grocery segment of the market. 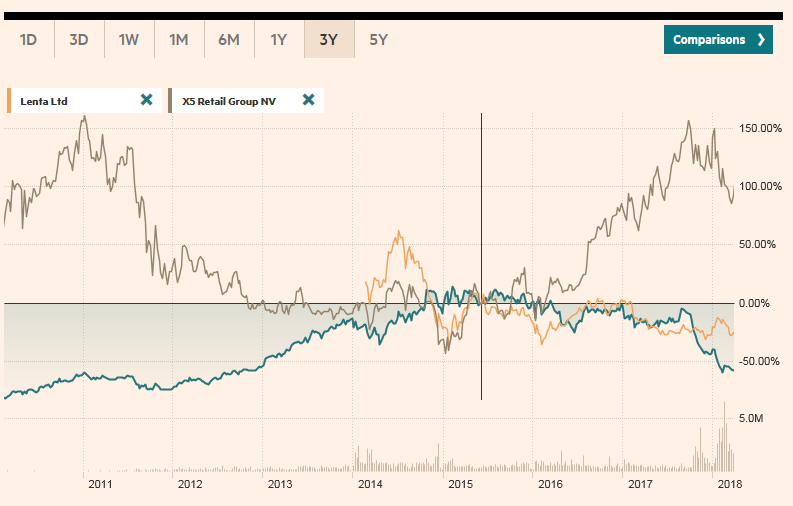 Magnit’s share price sank, but so too did Lenta’s. Vinokurov’s previous career record ties him to Lenta, as this story archive reveals. For detailed analysis of the impact of the war on the Russian retail market, click to open here. Russian sources claiming to find fault with Galitsky for the sellout in February fail to provide a comparative analysis of the competition – X5, Lenta, Dixy and O’Key. One of the most critical of Russian analysts is Mikhail Burmistrov, head of a St. Petersburg consultancy called Infoline-Analytics. He has told the media that Galitsky was resistant to making his store operations more efficient and introduce cost cutting which X5 accepted more swiftly. “The Magnit model was not focused on the needs of the buyer,,, and had ceased to be competitive. Probably Galitsky was not ready to admit it. He and Magnit had become the hostages of their long-standing success.” Burmistrov refuses to answer follow-up questions unless, he says, he is paid for it. Vinokurov, 35, was educated at Cambridge University in the UK. After a brief internship at Morgan Stanley in London, he has worked on Russian shareholding operations and asset takeovers for TPG of San Francisco; at Magomedov’s Summa; and most recently for the Fridman asset holding, A1. Marathon was formed with associates from the Fridman group less than a year ago. The Summa holding has collapsed since the arrest on March 31 of founder Ziyavudin Magomedov who, along with his brother Magomed, is charged with embezzlement and fraud; they remain in prison on remand. Until they come to trial, it is not clear what role Vinokurov may have played in the indictments. Follow the Magomedov asset operations here. Vinokurov’s role as an asset raider for Fridman has been reported in considerable detail, as have the fates of those asset holders who resisted A1’s operations. “For a number of reasons,” reports one Moscow investigative source, “Alexander Vinokurov is not yet in prison”. The report then details the allegedly murky operations of Vinokurov’s father and his associates; the violent tactics employed in TPG’s shareholding operations at the Lenta supermarket group; and the allegedly fraudulent privatization of the United Grain Company when Vinokurov was working for Magomedov. Stories follow of alleged extortion and other offences in Vinokurov’s acquisition of pharmaceutical businesses. The implication is that Galitsky was extorted into selling out or face further downward pressure on the Magnit share price. For a rollcall of individuals despatched to prison in the course of operations by “the raider Alexander Vinokurov [who] actively participates in capture of someone else’s assets and corporate scandals”, start reading here. For a report on “the end of raider Vinokurov”, published before he left Fridman’s employment and got started on Magnit, read this. Vinokurov has given his own account of the Magnit transactions to RBC. The newspaper published its interview on May 24. The innuendo was reserved for the illustrating photograph, showing behind Vinokurov the portrait of a man gripping hold of a fish. With Chemezov Vinokurov has reportedly been engaged in an attempt to build a national monopoly for the production and distribution of state-funded vaccines, eliminating competitors in the process. Until the Magnit takeover, Vinokurov and Fridman had been planning to instal outlets for pharmaceutical products in X5 stores. Vinokurov’s attempt, with VTB, to appoint British and Americans they control as independent directors on the new board of Magnit has not helped revive investor confidence. The 7-member board of directors which presided over Magnit during 2017 was dominated by Galitsky; noone could be termed independent of him, let alone representative of the foreign investors in Magnit. The annual report for 2016 claimed three directors were independents — Alexey Pshenichniy, Alexander Zayonts, Aleksandr Aleksandrov. Pshenichniy from Krasnodar region runs a small sports retail operation; Zayonts, a Muscovite, runs an interior decoration and construction firm; Aleksandrov is the operator of an entity called South Trading Company. Magnit’s annual report for 2017 reveals that Zayonts remained on the board, but ceased to be an independent. In his place, Dmitry Chenikov was appointed. The only details about him recorded in the annual report are that he was from Krasnodar, like Galitsky, and his only employment, the Magnit board of directors. Payment to the independent directors was $54,000 for the year without bonus. The new board of directors, announced by the company in April and confirmed for the new board election later this month, has been packed with British and Americans under Vinokurov’s and VTB’s control. They include James Pat Simmons, an American who has worked with Vinokurov at TPG, Lenta and at the Summa holding of Ziyavudin Magomedov; Gregor Mowat, British, a KPMG accountant; Timothy Demchenko, British, who runs VTB’s special situations projects and who participated with Vinokurov in the Lenta operation; he remains on the Lenta board; and Charles Ryan, an American, Harvard alumnus and informant for US Government agencies. Ryan was the purportedly independent director on the board of state shipping company Sovcomflot, and head of the board’s audit committee between 2008 and 2015, when the company was exposed and condemned in the British High Court in a long and costly series of litigations. Left to right: Gregor Mowat, Timothy Demchenko, Charles Ryan. Simmons is as camera shy as he has been untalkative about the asset operations he and Vinokurov conducted in their time together at TPG, Lenta and Summa. His record can be read here. Ryan’s role in the corporate record for dishonesty judged by the UK High Court in the Sovcomflot case can be followed here.